This is a really super villa on the prestigious Highlands Reserve residential and golfing community. It occupies a wonderful position looking through pine trees to the 18th fairway. 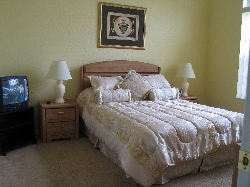 Furnished to a high standard and just 15 mins from Disney, it is ideal for families or golfing parties. 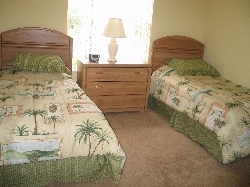 With 5 large bedrooms, 1 king, 1 queen and 3 twin, sleeping 10 comfortably with all bedrooms equipped with TVs and CD Players. 3 bathrooms (2 en-suite), a spacious and luxurious Family Room, fully fitted Kitchen, Games Room and large pool (heated if required), this is the perfect holiday home. The villa is fully air conditioned with all mod cons and our friendly and efficient local management team are on hand 24/7 to ensure you have a wonderful stay. The large and secluded, S-E facing pool area, is equipped with pool inflatables, sun loungers, tables and chairs, providing the perfect setting for relaxing with a cool drink after a day at one of the theme parks, or out on the golf course. Absolute bliss! Equipped with TV, DVD, CD & Radio. Sliding doors open onto the pool area. Fully equipped including, 4-ring Stove, Grill and Oven, Microwave, Toaster, Large American style Fridge/Freezer with ice and chilled water dispenser, Dish Washer and in the adjoining Utility Room, Washing Machine and Dryer. 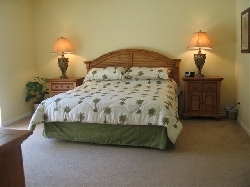 All bedrooms have linen provided, built-in wardrobes, TV, CD/Radio Alarm Clock and Night Light. All bathrooms are equipped with Bath, Shower, Towels and Hair Dryers. 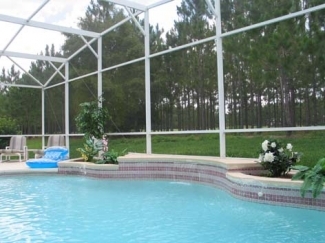 The pool area is completely secluded and not overlooked, as is the case with many Florida villas. External lighting is available for night use and the pool itself can be floodlight. You will find that many extras have been incorporated into the villa to make your stay as comfortable, enjoyable and entertaining as possible. 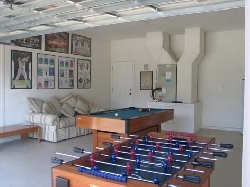 There is a Games Room containing a Pool Table and Table Football. Sliding doors open from the large Family Room onto the secluded Pool Deck which is well furnished with a patio table and chairs, comfy armchairs, sun loungers and side tables, as well as a selection of pool inflatables. A Lanai, complete with fan, provides a covered shaded area, for those wishing to withdraw for awhile from the hot Florida sun. FREE telephone calls may be made to all local and long distance numbers within the U.S.A., Canada, France, Ireland, Italy, Puerto Rico, Spain and the UK (excluding mobile phones). Low rates are available for calls made to most other countries. FREE Wi-Fi connection to the internet is also available for those guests who wish to bring their own laptops. Within Highlands Reserve there is an 18-hole par 72 Championship golf course, which is open to the public. The course offers some lovely scenery; pine tree-lined fairways, reminiscent of the Carolinas, open spacious fairways likened to the great Scottish courses and a bit of old Florida with citrus trees along the countryside. Large, fast, undulating greens make this course challenging and fun for all levels of golfers. Clubs can be rented and green fees include cart rental and tax. 'Golf Pac', one of America's largest golf vacation travel companies, ranks Highlands Reserve as one of their most requested golf courses year after year as chosen by their customers. 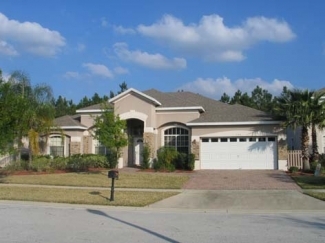 The villa is located within the delightful Highlands Reserve residential and golfing community situated in the regional area of Polk County, approximately 20 miles south west of Orlando city centre and sitting atop one of the highest areas of Florida, just 15 minutes from the Disney World Theme Parks. 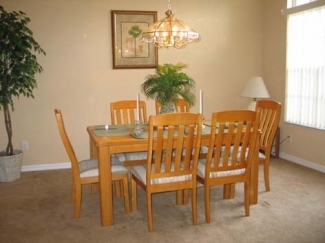 It is a private community of nearly 800 homes, a blend of short-term rental homes and permanent residents, all governed and regulated by a Homeowners Association and maintained to a very high standard. Available for the use of homeowners and their guests is a Children's Play Area, a communal swimming pool and a Tennis Court, just 2 minutes, from our villa (7 minutes walking). You will find your holiday home at the end of a cul-de-sac, overlooking the 18th fairway. 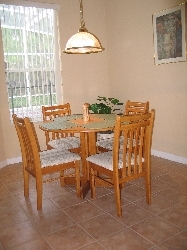 Quieter more peaceful surroundings are difficult to find so close to the exciting hustle and bustle of Orlando�s theme parks. It is the perfect place to relax and unwind. And yet, all amenities to enable you to enjoy an absolutely fantastic holiday are within easy reach. 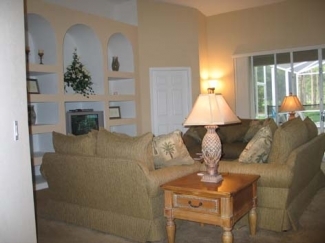 Highlands Reserve is 40mins from Orlando International Airport and Disney World is just 15mins away. There is a large supermarket for all grocery and pharmacy needs, Takeaways and Banking facilities within 5mins. Other theme parks and facilities are within easy reach, e.g. 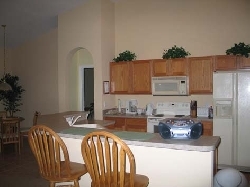 (all times approx) Sea World and Universal Studios 30mins; Busch Gardens 45mins; Kennedy Space Center 80mins; Atlantic and Gulf Coast beaches 90mins and the famous 192, with all of its many attractions, discount shops and restaurants 10mins.